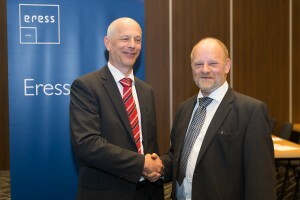 Ralph Luijt representing Vivens and Terje Stømer, Chairman of Eress Board of Directors. Eress, the organisation committed to implementing a standard energy management and billing system on trains, has welcomed its seventh partner Dutch energy procurement cooperative Vivens. Eress, the non-profit organisation consisting of Banedanmark (Rail Net Denmark), Infrabel (Belgian Railway Infrastructure Manager), Jernbaneverket (Norwegian National Rail Administration), Trafikverket (Swedish Transport Administration), Liikennevirasto (Finnish Transport Agency), SBB CFF FFS (Swiss Federal Railways), has announced Dutch energy procurement cooperative Vivens will joint its partners in the development, implementation and supply of Erex, a standardized system for managing and billing consumed energy on trains. 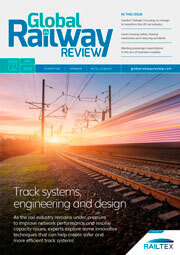 Erex allows Infrastructure Managers to control and receive accurate energy bills from each train. With this data, they send accurate bills to each of the train operators running on their national and cross border tracks. For train operators, Erex means that they pay just for what they use, since bills are based on precise energy measurement rather than estimates. In addition, energy consumption patterns can be analysed in order to lower consumption and costs in the future. “As one of the biggest electricity consumers in the Netherlands, the Dutch railways are making a remarkable job reducing energy consumption. As of 2018, all electric trains in the Netherlands will be running on green wind power, producing no CO2 emissions at all, enabling passengers to be truly green as they travel. Vivens is a clear example on how to continuously improve energy efficiency, while changing to 100% green electricity and we are very pleased to welcome them as our 7th partner,” concludes Gulbrandsen.